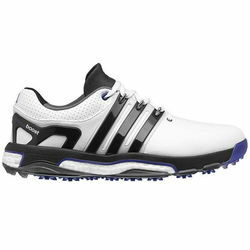 *Please note These shoes are made for the right handed golfer and some reviews suggest to order a 1/2 size larger as they do run narrow at the toe. 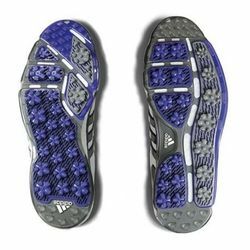 Bringing the latest technology and superior performance together in one irresistible package, adidas presents the asym Energy Boost � designed with an asymmetrical upper and outsole designed to harness swing power in a sleek modern design. Dramatically assisting your game, the asym features full-length boost midsole foam for unrivaled cushioning and endless energy, Energy Sling technology to guide energy transfer and prevent power leaks, and a molded EVA tongue top with fitsleeve for a more precise, comfortable fit. For enhanced stability and grip, the advanced puremotion TPU outsole has strategically placed gripmore traction, while the external heel counter provides additional lateral stability and support and the advanced laceStop ensures a secure and consistent fit. Finally, the soft and breathable microfiber leather upper offers climaproof protection and the fitfoam PU sockliner provides great cushioning, support and comfort in a variety of conditions. 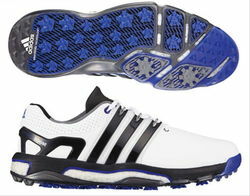 The Adidas asym Energy Boost golf shoes are the first fully asymmetrical golf shoes which reflect the radically different needs of each foot during a swing. They're as different from each other as they are from every other pair of golf shoes in the world. Cutting-edge heat mapping & force plate technologies displayed the different forces exerted in each foot during the golf swing. Initial designs for the asym demonstrated the need for lateral support and directional traction on both feet in slightly different areas for the three main stages of the swing. The first experimental outsole focused on promoting proper foot architecture resulting in more natural body rotation and better timing from the take away through the toe-off. Contact: �	We are an electronic, phone free organization (with real people to answer emails). �	Any Questions? Comments! or Requests we will do our best to reply the same day or the next BUSINESS day. (M-F 9AM-6PM EST) �	We reply to all e-mails, if you did not get a reply try to contact us directly thru e-bay and make sure your e-mail spam setting allows our e-mails in. -------------------------------------------------------------- OVER 45,000 REPEAT CUSTOMERS. MICHIGAN RESIDENTS PLEASE ADD 6% SALES TAX. I ship same or next day after payment. Items must be returned within 14 days of receiving and in new and sellable condition with tags attached in manufacturer poly bags. Restocking fee may apply. Contact: �	We are an electronic, phone free organization (with real people to answer emails). �	Please use contact seller feature in ebay for any Questions concerning ebay items? any Comments or Requests sent to grdnhar@aol.com we will do our best to reply the same day or the next BUSINESS day. (M-F 9AM-6PM EST) � If you have already purchased, please include your ebay name � We reply to all e-mails sent to grdnhar@aol.com, if you did not get a reply try to contact us directly thru the e-bay message system and make sure your e-mail spam setting allows our e-mails in.